In our next tutorial we will learn how to use the serial and infrared functionality of the mBot. Clicking on the each of the above links will open them up a new window. Once you’ve connected to the mBot using your preferring coding solution (mBlock on PC or mBlockly app on the tablet) you are ready to move onto the next tutorial. Here are the list of prerequisites for working on the Makeblock mBot robotics development track. 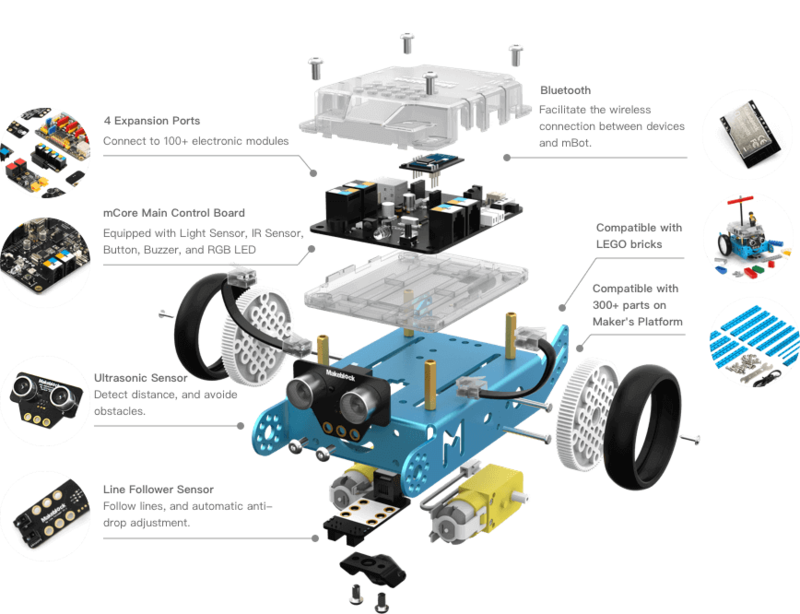 This robotics development track makes extensive use of the Makeblock mBot. Head over to OzToyLib and pick-up a Makeblock mBot. You will need to download and install the Makeblock mBlock code editor for your laptop/computer. The mBlock code editor supports block based coding, coding in the C++ (Arduino) language including Python. Once you’ve obtained the Makeblock mBot and installed the mBlock code editor for your laptop/computer you are ready to proceed with the tutorials. MakeBlock also offers applications for use on your tablet / hand held device. Options for the Andriod / iPad include – mBlockly or MakeBlock HD. See the Makeblock mBlock link for additional details.